A struggling school is getting a much-needed makeover on campus. 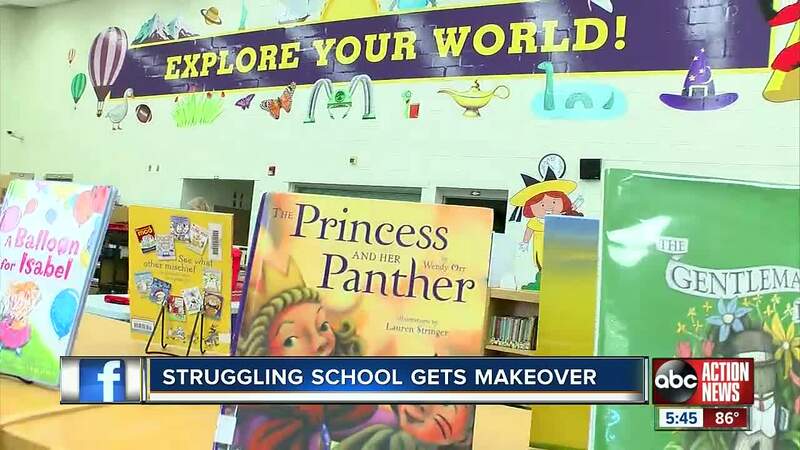 BROOKSVILLE, Fla. -- An elementary school in Hernando County that has struggled in recent years is making a complete transformation with the help of one local business. Nine-year-old Holly Coldiron is proud to show off the new look of Moton Elementary. The school is covered with hundreds of brand new signs. "On our playground, we have new rules up there," Holly said. Signs big and small -- from rules to organization, school logos, and even fun learning tools -- were all donated by a Brooksville signage company called Accuform. "There are a lot of schools here in Hernando County that is lower on the grade scale, so we wanted to get into some of those schools and spruce things," said Alex Pennington, assistant plant manager for Accuform. Moton Elementary has had its share of struggles. For years, it was a failing school and last year, all the teachers were fired. This year, they started with an entirely new staff. Principal Patty Martin said the change in staff had been hard on students. "They’re struggling with that because they feel like people keep leaving them," Martin said. That’s why the new look is so much more than a look. They say it's a new start. "It has really encouraged the kids and made them feel worthy and valued," said Kari Kimbrough, math instructional teacher at Moton. Staff say the new signage has brought the school pride and a sense of togetherness. "They’ve added to the community that we’re trying to build. It's a place where kids can be proud to come," Martin said.